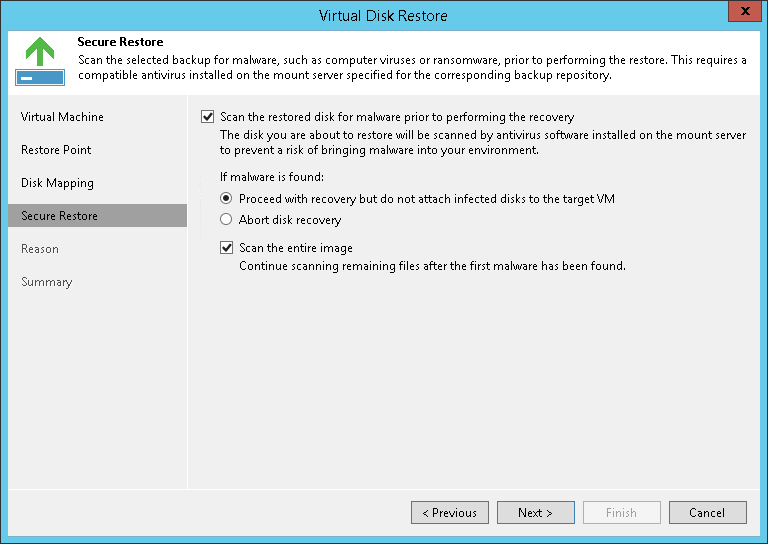 At the Secure Restore step of the wizard, you can instruct Veeam Backup & Replication to perform secure restore — scan virtual disk data with antivirus software before restoring the disk. For more information on secure restore, see Secure Restore. At the Secure Restore step of the wizard, select the Scan the restored disk for malware prior to performing the recovery check box. Proceed with recovery but do not attach infected disks to the target VM. Select this action if you want to continue the virtual disk restore. In this case, the restored disk will not be attached to the target VM. Abort disk recovery. Select this action if you want to cancel the restore session. Select the Scan the entire image check box if you want the antivirus to continue the virtual disk scan after the first virus threat is detected. For information on how to view results of the malware scan, see Viewing Malware Scan Results.